The 529 College Savings Plan allows investors to put a sizable sum of money specifically toward college tuition down the line for a child or young relative. The income and asset appreciation garnered from them are not taxed in any way, and the money cannot be repurposed, so they go to pay for college. But the 529 plans, supported and sponsored by state governments and some investment companies, are not widely used. Spectrem discovered the reasons why. 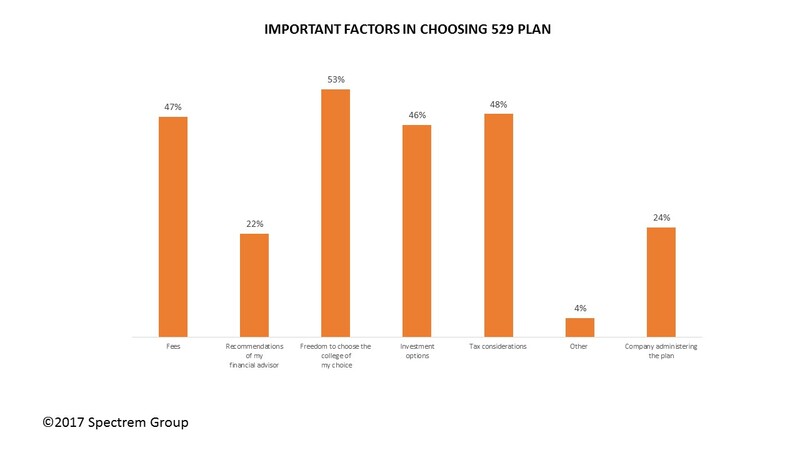 In Wealthy Investor’s Usage of 529 Plans, affluent investors explained the reasons they signed up for a 529 College Savings Plan or the reason they have not. Only 16 percent of affluent investors are currently invested in a 529 Plan and only 20 percent of investors have ever been invested in the plan. That’s an extremely underwhelming endorsement for the programs, which are sponsored either by individual states or by investment or money-management firms. Among those that have signed up for 529 plans, more than half (53 percent) said the freedom to choose the college of their choice caused them to invest in the plan. When the plans were first introduced in the late 1990s, some restricted college choices to only the state where the plan was sponsored, but that is no longer the case, and almost all 529 plans offer arrangements with almost all public and some private colleges. The tax considerations are the next most appealing feature of the plan. Unlike any other savings plan an investor can put money in to prepare for college, the 529 plan funds, including any revenue generated by the investment, are tax-free as long as the money is used to pay for a college education. Considering the fact that dozens of thousands of dollars are placed in a 529 plan to pay for eight semesters of college, the tax savings would be huge. There are financial providers which offer 529 College Savings Plans, and those that do should tout the tax-advantaged status of the plan for investors. Any investor who invests in a 529 plan through a financial provider instantly becomes a potential client for other investment options which have tax advantages over time. Few products completely eliminate taxes on revenue created through investment the way 529 plans do, but there are many products that forestall tax hits until much later, which makes them attractive to investors. Other reasons investors invest in 529 plans include fees (47 percent), investment options (46 percent, although not all plans offer this), and the company administering the plan (24 percent). The good news for advisors is that 22 percent of 529 plan participants got involved because their financial advisor told them to do so. Considering the tax advantages and the fund growth seen when an investor signs up for a 529 plan years in advance of needing the money for college, why do investors choose not to invest in a 529 plan? The reason most stated (35 percent) is “I have or will use other investment vehicles to fund my children’s education.” While that is certainly one way investors prepare for the day when their child needs tuition money, those vehicles usually are not tax-free, and their fund growth is not guaranteed. A better bet on why investors do not invest in 529 plans comes from the 7 percent of investors who said “I don’t like to tie my money up and not have my children attend college.” Many investors believe they can outperform a 529 plan with their own investments, even in light of the tax advantages enjoyed by 529 plans. It is noteworthy that 27 percent of investors under the age of 40 said they did not want to place their money in an account they were uncertain they would use. There are also investors (9 percent) who expect their children to pay for their own education. The key to making a 529 plan payoff is by investing many years before a child will need the funds. Of those investors who had 529 plans, 6t3 percent made the initial investment when the child was between the ages of zero and five years old. Many investors avoid using advisors because they feel their fees are too great and they do not believe the advisor makes suggestions in the best interest of the client but rather suggest products that produce the greatest income to the advisor. One way to combat that cynicism is to suggest and promote the idea of 529 plans for investors with young children or planning to start a family. This is not a product that will make an advisor rich, but it will certainly benefit the investor, and the investor might take note of the fact that a financial advisor made the non-lucrative suggestion. It works the same way the Macys-Gimbels behavior worked in Miracle of 34th Street.